As more and more games see their releases solely as a digital-only title, the more the title requires marketing to create awareness. It's easy enough to walk into a Best Buy or Gamestop and see the latest releases on the rack or those that you can pre-order, ensuring you don't miss out on getting that game at launch. Digital games, however; lack this type of exposure and can often feel neglected and missed out on. Had it not been for a Youtube video showcasing a series of new releases this past week, I would have completely missed out on Omensight, a title that kept me entertained for hours, and a game I strongly recommend adding to your library. Set in the same world as their previous game, Stories: The Path of Destinies, Spearhead Games have constructed a follow up in Omensight. While I missed out on their prior game, Omensight has made me want to track down and explore deeper into this fascinating world. Omensight is a game that is based on player choice, with your actions determining the outcome of certain events. With the ability to travel back to the same morning, you are able to change those choices to see almost every possible outcome while still retaining any information you have learned otherwise. You play as the Harbinger, a being sent to prevent the world from reaching its end. You are known among the people as a mere myth, but the sight of you will rally those to your cause, even if they have their doubts about what they can truly offer you in return. To prevent the end of the world, you will rely on four individuals to assist you in uncovering the truth of who murdered the Godless-Priestess, Vera. In order to stop an ancient evil from escaping its prison, one that was held at bay by the Priestess herself, you will travel back in time to the morning after her death, attempting to put the pieces together about who killed her, and why, and how you can prevent the end of the world. You will have one single day to uncover as many clues around the circumstances surrounding her death until the world ends and you must relive the day over again. Each trip into the past requires that you join up with one of four possible companions; Ratika, Draga, Ludomir, and Emperor Indrik. Each of these characters will cross paths multiple times throughout the day and many of your choices will determine how you interact with each of them. Will you throw down and battle to the death, or work alongside them for the greater good? 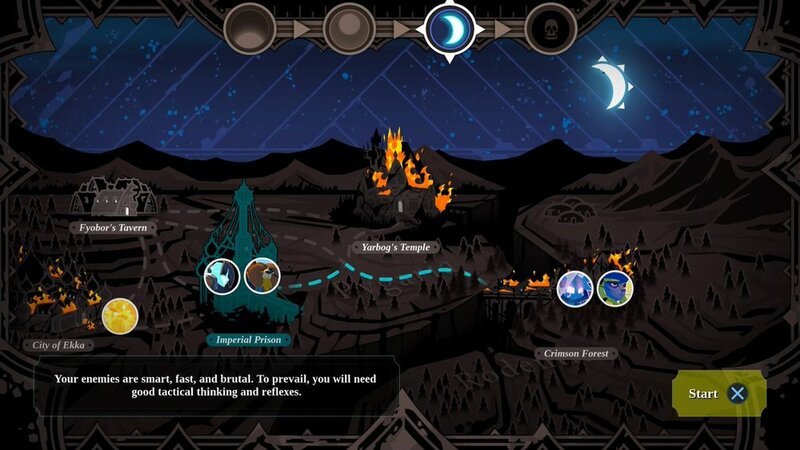 Whereas most choose your own adventure games only allow you to take one path, Omensight allows you to take all of them. Depending on the difficulty you choose, the game will keep a record of the investigation, allowing you to piece together the clues you discover, the whereabouts of each character during the day, as well as which seals you have discovered. Some events may lead to a character's death, but revisiting that scene and going about it a different way may prevent that death from even happening. Omensights's Anthropomorphic characters are wonderful and have some rather enjoyable designs to them. While the art style is certainly different, much of this game reminded me of Pyre, a game that also has some animal-based characters and a similar look. There is the hooded Ratika, the leader of the Rodentian forces. She plays the balalaika, a musical instrument with mystical powers. She is witty, often hilarious, and looks out for her people. Ludomir is a Rodentian freedom fighter, while also being a bear with an eye patch, who begins his quest via an assassination mission to kill Emporer Indrik. Ludomir is also a good friend of Vera and will stop at nothing to bring her murderer to justice. Draga, who is the first character you will encounter, is the General of the Pygarian forces under the command of Emperor Indrik. Draga wants the war between the Pygarians and the Rodentians to end, but with as little bloodshed as possible. Finally, there is Emperor Indrik, the ruler of Pygaria. While the Emperor is ruthless and power hungry, he does so to push his people towards greatness, unlocking their true potential. You are made aware at many points in the story of his cruelty, but Indrik is a character that has many layers to him and frankly, is my favorite of the bunch. As you unlock important milestones, you will earn a vision called an Omensight. These visions can be gifted to each of your companions at key points in the story to unlock new paths and garner new information to your case. These visions can also have a profound impact on the story as well as changing the motivations of certain characters to a significant degree. Watching once feuding companions find common ground and broker peace was some of my favorite parts of the story and seeing actual character growth is certainly a strong selling point of this game. The story itself can certainly appear to be predictable or show its hand in the early hours, but there are several twists and turns that kept me guessing through its 8-10 hour length. As you explore each of the few areas in the game, you will encounter colored seals; green, pink, and yellow, that block access to certain areas at the start of the game. As you gain the trust of Ratika, Draga, and Ludomir, you will be shown the ritual that is required to access these seals. Behind most of these sealed doors are chests filled with Amber crystals that you will use to power up your Harbinger, or memories that grant you further knowledge of certain characters and their motivations. These sealed areas can also open up new pathways in each level that offer up new methods to reach previously unreachable sections of the environment. When each day ends, you will be saved by a Witch, a mystical being, not unlike the Harbinger, who exists outside of time. This Witch is the protector of the Tree of Life. It is here, at the Tree of Life, where you can upgrade the Harbinger via the experience you have earned, or through the Amber you have gathered. The experience totem will unlock new skills when you offer up enough experience to level up, whereas the Amber totem will sell you upgrades to your attacks as well as decreasing the cooldowns of your companions special abilities, some of which actually affect your direct involvement in combat. Omensight's combat is both frantic and unresponsive at the same time. While your basic attacks and dodging are fluid and work well, the special abilities themselves are either inconsistent or lack the responsiveness to keep you alive, at least some of the time. As you combat your foes, exclamation points will appear above the head of those who are about to strike. By using your dodge, you can escape these attacks and use that to either attack them head on or retreat to safety. You unlock a variety of different abilities as you level up such as a time bubble that stops everything inside its radius, an instant kill attack, a grapple, and a powerful blast. The bubble itself is very useful, but I found I had to be motionless for the button to even register as you can't trigger this move while in combat or attacking in the air. As useful as it is, I found I either had to use it just outside of a group of enemies or take some damage attempting to trigger it in a large group. The blast is also inconsistent as the game wouldn't often register my holding down of the button or it would trigger the blast as I would be rapidly pressing the square button for my basic attacks. If these few issues were addressed in a patch then Omensight would have insanely enjoyable combat. 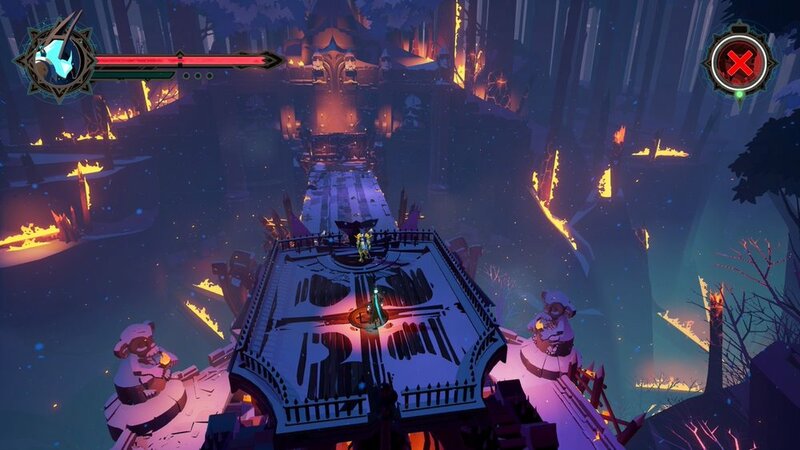 The visuals of Omensight are visible in the pictures provided, but seeing this game in motion is another story. While the game can appear to be simplistic, it is this simplicity that the game truly succeeds. The characters, the environments, and all the flashy effects during combat are beautiful and offer up a truly gorgeous game. While there is only a small handful of environments, you often get to visit them during different times of the day and this can change up the look and tone of each location. As the story unfolds, the environments continue to evolve and dramatically change even further. Omensight is the very definition of the phrase; less is more. For the most part, Omensight is entirely voiced. Each of the four companions are wonderfully vocal and frankly, every single voice suits them. The chipper and high-pitched Ratika fits perfectly alongside the older and wiser tone of Emperor Indrik. The only parts of Omensight that don't quite measure up are in the supporting cast that can often sound like the host on a children's TV show trying to change their voice to each character as they read out a storybook. The musical score is fantastic, and while nothing is memorable or something you will find yourself humming along to, it serves its purpose extremely well. Apart from the issues I had with combat, Omensight is a truly fantastic game. The characters, the story, and the stunning environments truly stand out and everything comes together to deliver a solid package. While the repeated trips to the same locations during your time jumps can create a sense of repetition, it never felt like I was there to do the exact same thing. The game even allows you to skip portions of the level should you only need to change one event later on, a feature I was super thrilled to see. Omensight is a remarkable adventure with some superb writing and wonderful characters that truly needs to be experienced. omensight WAS PURCHASED BY THE REVIEWER.